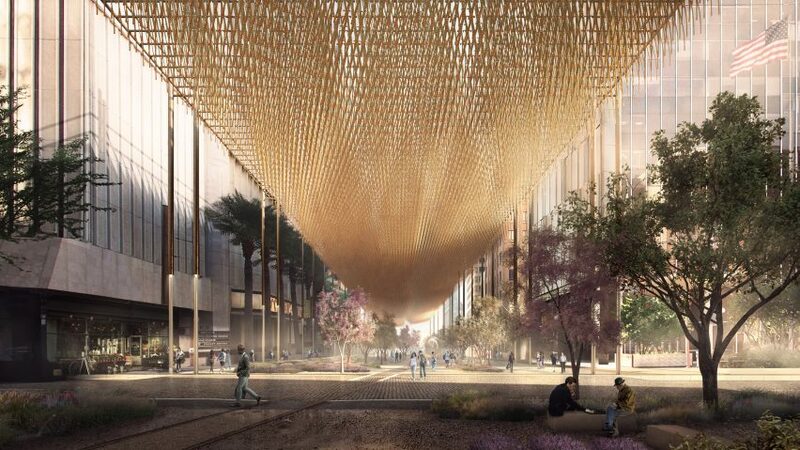 A scheme to convert roadways in Phoenix into car-free and plant-filled corridors shaded by woven canopies has won first place in a design competition. Designed by local firm Blank Studio Design + Architecture, the plan calls for transforming existing streets in Phoenix – a desert city in Arizona where summer temperatures regularly climb over 100 degrees Fahrenheit (38 degrees Celsius) – into "unique corridors of inhabitable, comfortable, public space". To achieve this, the team proposes removing cars and replacing strips of asphalt with dense ribbons of flora. The former roadways would be covered with "cloud-like" fibre canopies that would reduce the intensity of the sunlight penetrating the cityscape. The scheme, called Jacaranda Avenue, won first place in the 2016 Metro Design Competition organised by the Phoenix chapter of the American Institute of Architects. "A Japanese word, komorebi, describes the ephemeral dappling of sunlight beneath a tree canopy," said the architects. "We asked what could happen if this dappled shade condition was generated over large swathes of this Sonoran Desert city." The canopies would be made of thick strands of sisal, a natural fibre that comes from the Mexican agave plant. The warm-coloured material is lightweight and durable, and can be replaced as it ages. Each strand of rope would measure two inches (five centimetres) in diameter and stretch up to 25 feet (7.6 metres) from the centre. The fibre cords would be firmly attached to a framework, although coiled extensions would oscillate gently below, evoking a field of swaying grasses or kinetic sculptures by artists such as Ned Kahn or Christo and Jeanne-Claude. The streets would be emptied of cars and filled with urban amenities such as cafes, playgrounds, sculpture gardens and markets. "Below this 'cloud', the streets now belong wholly to the pedestrian," the team said. "Only mass transit exists within these corridors – no cars." Bioswale channels would collect and repurpose rainfall, while greywater waste from adjacent buildings would be used to irrigate the landscape. "Riparian habitats are encouraged, and urban wildlife will take hold," the architect said. The scheme was influenced by the "sudden, fragrant saturation" of Phoenix after a rainstorm. "The aroma of creosote and sage, steaming asphalt, and moistened soils – this essence forms the very basis of next Phoenix," the firm said. The design competition asked entrants to propose design interventions that clarify and strengthen the identity of Phoenix – a young, growing city with evolving economics and resources. "Phoenix enjoys broad national and international familiarity while not always being recognised for its distinct identity," said the organisers. "It's often seen as a place where people have come to re-invent themselves, a place of transition." Entrants were encouraged to create interventions that capitalised on the city's distinct assets, infrastructure and climate. Jurors included architects, designers and city officials. Other similar projects in Phoenix include Shadow Play by Höweler + Yoon, a faceted metal canopy constructed in an urban pocket park. Renderings are by Forbes Massie.